From Water Clarification to True Level 1 & 2 UVC Sterilization. (4) Effect of UV Sterilization on minerals, chemicals, etc. This first picture to the left demonstrates the anti-oxidizing abilities of a true level one capable UV Sterilizer utilizing a HO UVC Lamp (note that the majority of lamps sold now are medium pressure UV lamps with 1/4 the UVC output). Using Potassium Permanganate, which is an oxidizer in both a control tank (left tank) and one utilizing an AAP Compact UV with a HO UVC Lamp (right tank). It is noteworthy that a "Category B" UV Sterilizer was used for this experiment. A "Category A" such as the AAP/TMC Vecton or Advantage would have cleared/reduced the oxidizer quicker. What happens is, as Potassium Permanganate is reduced, it goes from red to brown to clear. It is easy to see that the UV Sterilizer tank goes through these stages well ahead of the control tank. The implications demonstrate a true UV Sterilizer's ability to lower oxidative stress on fish and other inhabitants (including plants & corals) and work to provide a better Redox balance as well as known disease prevention & clarification abilities. 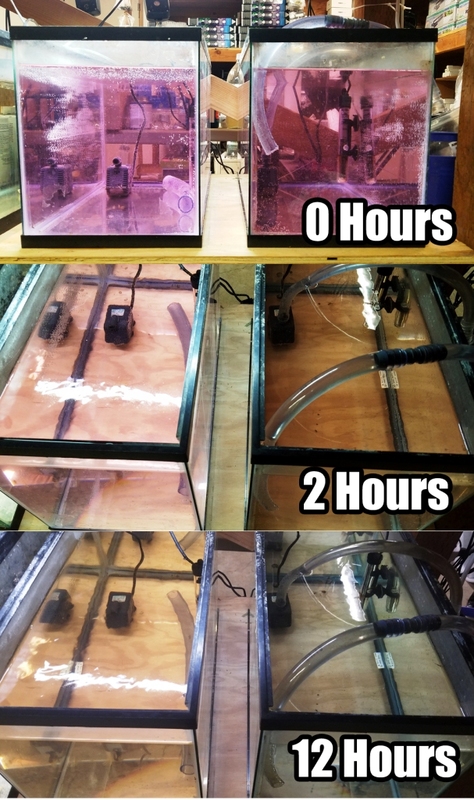 The picture below further pictorially displays how a TRUE UV Sterilizer can help not only with clarification of an aquarium/pond with an assumed healthy bio filter (which should be but a minor reason to own a TRUE UV Sterilizer). It is noteworthy that clarification/green water control is much more effectively accomplished via a True UV Sterilizer over the majority of UV Clarifiers marketed as UV Sterilizers. HOWEVER, and more importantly, a TRUE UV Sterilizer helps with disease prevention & Redox Balance (via proven lowering of oxidative stress) when properly connected (meaning flow rate, pre-filtration, etc.) and properly maintained by replacing with high output UV lamps/bulbs (not the economy replacement lamps/bulbs sold by discounters that have as little as 25% of the necessary UVC as a HO UV lamp). This is the thrust of this article, as while it is certainly a good tool for green/cloudy water especially in ponds (assuming the bio filter is healthy), it is this Sterilization/Redox Balance aspect that years of professional hands on use in 1000s of applications has shown to really make the difference. This is why, even for Pond use, you are better off with a Category A UV Sterilizer over an economy Category C UV Clarifier. Please click to enlarge for a better view. This of course is a simplification, so please read the ENTIRE article along with cited references for a better understanding so as to make a more educated decision of whether a true high dwell time level 1 or 2 capable UV Sterilizer is for you or maybe just a basic Clarifier or nothing at all! I started using UV Sterilizers in 1977 (I have been in the hobby since 1968), and started experimenting with these devices in 1978. This includes designing my own to experiment with theories to explain certain results. I also used control groups with many of my larger aquarium maintenance clients (one alone, the Bahooka Restaurant, had over 100 aquariums). I also have read much research, including research outside the often anecdotal aquarium keeping hobby, which often explained results I was getting in some experiments in the 1990s that explained the role in Redox and UVC and how True UV Sterilizers can lower oxidative stress. One way I measured results in testing specific UV devices was to use a murky slurry of water with bacteria grown from decomposing fish food and back yard dirt, and then time how long certain UV devices would clear the the aquarium this was added too. I have used most every type of UV Sterilizer & Clarifier over the years, including; the Nektonics UG Filter UV, the Lifeguard, Aqua UV, Emperor UV, Terminator UV, AquaTop UV, TMC UVs, Tetra UVs, and the list goes on!! Clear Green Water in Aquariums or Ponds when run in parameters for clarification. Clarification is the most simple use of a UV Sterilizer and in fact many if not most UV Sterilizers are ONLY capable of clarification, which is why many are misnamed "UV Sterilizer" when in fact these lower end models are actually just "UV Clarifiers". It is noteworthy that a true level 1 capable UV Sterilizer will also clear green water in ponds much more quickly and maintain water clarity MUCH better than a basic UV Clarifier!! AID in the control of parasites such as Ich or Cryptocaryon by improving immune function and at very low flows can more directly aid in parasite control in the water column, although not on fish directly (that requires Level 2 Sterilization; under 8-12 gph per watt, which is still not 100%). 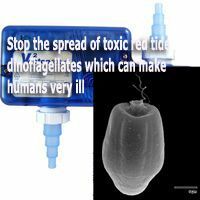 Stop the spread of toxic red tide dinoflagellates which can make humans very ill and has recently been shown to infect home/office marine aquariums. These red tide dinoflagellates have been shown to be effectively destroyed by either level one or higher UV Sterilization or an ozonizer connected to a Protein Skimmer (much more so than by chlorine). Unfortunately many of the UV Sterilizers flooding the market for under $50 including "Hang on Back" (HOB) and many "In Tank" Submersible UVs at best can ONLY control algae and very limited bacterial blooms, these CANNOT perform the level one Sterilization needed for true disease control and aid to Redox Balance due to flow rate & design as well many utilize lower cost medium pressure UV bulbs. These low end UVs often have very limited life times due to design, such as ballasts/transformers that last as little as 8 months. The UVs I promote cover different niches from lower end to higher end. One thing all have in common is they work within their niche. This does not mean an AAP/SunSun Compact (with HO UVC Lamp) is as good as an AAP/TMC Vecton, Aqua Classic, or any other premium high dwell time UV, but it is the best or equal to the best of the Compact UV niche. Some of those I do not promote simply do not work. In many cases other UVs I do not promote do work well, however after years of experience, I found a better product in terms of either effectiveness (in part due to dwell time), value, or parts availability the better choice for my maintenance clients (example the TMC line over the Aqua or Emperor line of UVs). PLEASE READ THIS ENTIRE ARTICLE TO UNDERSTAND WHY, INCLUDING THE FACTS/MYTHS SECTION! 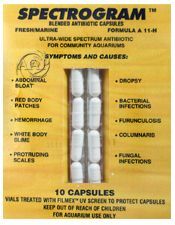 The most effective medication BAR NONE for the treatment of Columnaris in an aquarium when used as part of the four step program of Columnaris treatment. A more synergistic combination than purchasing Kanamycin & Nitrofurazone separately. Ultraviolet radiation, referred to as UV or UVC irradiation for sterilization purposes is a form of ionizing and non-ionizing radiation. UV light energy is classified as such: UVA 400 nm - 320 nm, UVB 320 nm - 290 nm, and UVC 290 nm - 100 nm. All light is made of photons, or vice-versa. 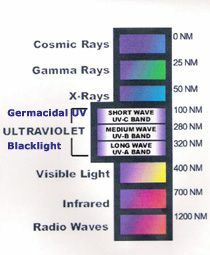 The frequency the photons vibrate at determines the color/wavelength of the light. Infrared light is wavelengths over 1000nm, while UVA is around 400nm, and UVC is around 250nm. That covers the visible spectrum and immediate neighbors, all the colors are between about 450 (blue)-700nm (deep red to near IR). The most important thing here is that the shorter the wavelength, the higher "energy" each photon has. To the extreme, even shorter wavelength/higher frequency photons are the commonly known X-Rays and Gamma rays. Since photons are subatomic particles with mass, they can disturb chemical bonds, from bumping an electron off a molecule (Visible) to breaking apart molecular bonds (UVC), to modifying the makeup of each atom directly (Gamma Rays). All photons have a "Chance" to do any of the above, but the higher energy events are far more likely to happen with a high energy/high frequency photon interaction over a longer wavelength/visible spectrum photon. UVA and UVB that can reach the Earth’s surface are primarily non-ionizing and do not have enough energy to ionize atoms. However, the longer wave UVA and UVB can cause molecules to vibrate and rotate resulting in heating up. The shorter wave UVC (used in UV Sterilization) light will ionize many atoms and molecules as compared to the even shorter wave Gamma Rays which will ionize most atoms. UVC is better at breaking molecular bonds as well as rearranging electron configurations, this is how UVC sterilizes, and why Dwell Time is important. The longer the substance is exposed to UVC light, the greater the chance that all molecular bonds will have been hit by several high energy photons, causing the molecular bond, from simple weak chemical bonds to stronger ones in simple celled DNA material to be broken, rendering the pathogen/organism inert or dead. Hence the reason sunlight causes skin cancer, and sunblock/sunglasses block light of wavelengths shorter than UVA to protect your eyes and skin, UVA tans well, UVC mostly causes damage, burns, and cancer. Near the limits, at X-Ray to Gamma Ray Sources are used medically to "disrupt" cancerous tumors, with the same interactions mentioned in this post, but at far, far higher energies. 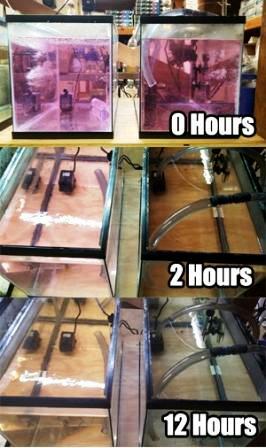 Ultra violet sterilization is an effective tool especially when combined with other tools such as new fish quarantine (or new fish baths) for disease prevention in aquariums, ponds. 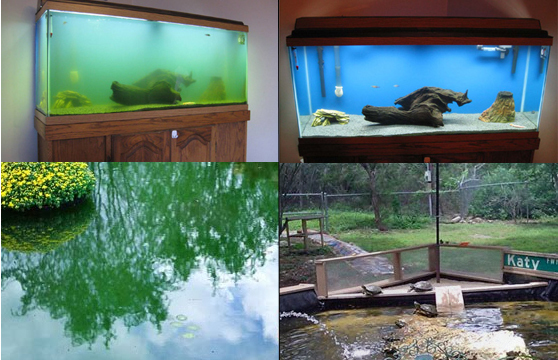 Also for general water quality control such as Green Ponds or Cloudy Aquariums. As well the use of UVC Sterilization is useful in home, office, hospital air purification & even UVC/Redox Blood therapy. For this reason a properly installed & designed High Dwell Time 'TRUE' UV Sterilizer helps improves a fish’ chances in fighting bacterial diseases or even parasitic diseases such as Ich that UV Sterilization is less effective in destroying directly . Part of the reason for true UV Sterilization is that the UVC irradiation which is contained in a a high dwell time UV Sterilizer will break down oxidizers in the water column (via Redox Balance) that would otherwise lower a fish’ immunity, this aspect is often missed as many only focus on the clarification/algaecidal properties of UV Sterilizers, which is why many persons now purchase low price UV clarifiers from discounters not realizing that there is a difference between what is marketed as a UV Sterilizer by in reality is only a UV clarifier. *“Fish Immune System and UV Sterilization, Sterilizer use”. As for the Redox Balance, this is an often overlooked aspect of both freshwater and saltwater aquarists. The Redox Balance is basically the oxidation and reduction properties of water (the oxidation side of Redox). In fact a tidal wave of new research (mostly outside the aquatic community) is demonstrating just this aspect of UV Sterilization, including the use of UV-C to demonstrate water quality. This does not mean a properly installed UV Sterilizer will kill all pathogens, as it certainly cannot and really you would not want this anyway just as you would not want to live in a bubble unless you have no immunity whatsoever. The UV simply improves the fish' own ability to ward off infection by both lowering pathogens (better; by weakening), and lowering oxidizers which naturally improves a fish' ability to fight off any disease. There is a lot of new evidence as to the benefits of UV sterilization for ALL fish, and many myths have been dispelled such as “UV Sterilizers destroying beneficial nitrifying bacteria”. I am also constantly researching this subject, so this article may not be the same article in three months, so please check back. UV Sterilization is also effective for controlling suspended algae (green water) in ponds in part by clumping the algae which then falls to the bottom or is filtered out (along with proper filtration such as Veggie Filters/pressurize filters which are just as important as a UV Clarifier/Sterilizer). This of course assumes your aquarium or pond has a healthy bio filter. UVs are also useful in Reef aquaria, especially new ones where the chance of disease introduction is high and the UVs help in keeping a balanced Redox Potential is useful as well. While it is also noteworthy that a UV Sterilizer does NOT take the place of a new fish quarantine or fish bath, NOR does the quarantine take the place of a properly installed UV Sterilizer for over all total aquarium/pond water quality & disease prevention fish husbandry. For those who prefer, the sterilizer can be placed on a timer or turned on and off as needed once the aquaria has aged. One argument against UV Sterilizers in ponds is that they are not natural, but for the clarity most persons want out of their pond, this is not possible without either UV sterilization or many other pond configurations. Many articles I have read state that a UV is not that beneficial to an established aquarium as a healthy aquarium depends on beneficial bacteria typically growing on media in your filter which neutralize ammonia. Unfortunately the problem with this statement is beneficial bacteria belongs in the filter, not in the open water. Also the lack of a UV Sterilizer may be fine for some advanced aquarists who are not adding fish and have a healthy Redox Potential/Balance, but not in the real world of average and above average aquarists that I have dealt with in the 100s of aquariums I have serviced. To be even more blunt, I conducted several controlled studies in the 1990’s using some of my many contracted aquariums (for which my ongoing research is to explain some of the results, such as improved immunity). In these studies where I mostly used goldfish (Orandas & Ryukins), the results were clear in that the incidence of disease was lower, longevity was longer, and over all vitality was better. The results were even better yet when improved feeding, improved cleaning, improved mineralization (positive mineral ions) are thrown into the equation. These results were facts that are also backed up by years prior and after in anecdotal experience with the 1000s of aquariums I have had under my company's care. This is not "hand wavy" hocus pocus as some aquarium forums run by disrespectful persons with little actual experience that hide behind computer screens would have you believe. What this means is a true level one capable UV Sterilizer is a useful tool, but also NOT the solution to all your aquarium or pond problems. It will not eradicate all dinoflagellates in your marine aquarium, no matter how good your UV Sterilizer or how slow your water is run through the device. Nor will it make up for poor pond or aquarium filtration, feeding, water chemistry, etc.!!!! By using low end equipment such as "Killing Machines" that might ONLY clear the water and then claiming these did nothing to protect the health of their fish is NOT a scientific argument against these devices. As well despite these long term observable and researched facts, many still will deny these benefits other than clarification. This problem of denying facts while often making "Ad Hominem" attacks such as claiming articles like this are "based on selling this equipment" is unfortunately still quite common, often in anecdotal or poorly moderated, "cut & paste information" forums that are unfortunately quite popular. This of course does not mean Volvos are "fine automobiles", however an argument against the person making the statement by personally going after the author rather than providing evidence that the Volvo is not a "fine automobile" (by whatever measure this might be, since a different measure might produce different results), is by definition the logical fallacy of an Ad Hominem attack. What is also noteworthy throughout this article is I DO provide references, and yes a lot of information is based on my own vast experience and experiments where by I then arrived at product I would recommend. My goal with my large aquarium/pond maintenance company was to be more profitable by cutting back on disease incidence, water clarity issues and more, as most of my clients were under a contract that included replacement of livestock. So in the end if you were to "follow the money", my financial incentive was NOT to sell UVs, rather to to put together a system that worked and which included far more than UV sterilizers, such as quarantine, feeding, water parameters, etc. So for those rude individuals who use "appeal to authority" logical fallacies and call this article "hand wavy", fine, but for those who have more respect for other's decades of work and experience as well as continued ongoing research, I am simply reporting on my findings, both researched and anecdotal (but anecdotal based on 1000s of aquariums). As a reader, please follow the references cited, please also apply common sense logic too, as many of the concepts applied in this article do NOT require parking one's brain. For the critics of what products are promoted, of course I promote products, as I run a business. HOWEVER, I have professional experience dating back to 1978 (longer in the hobby), and I have used and experimented with most well known brands with literally over 1000 applications. This includes the Aquanetics UV, Aqua UV, Lifeguard, Tetra UV Turbo Twist UV, Laguna UV, Emperor UV, and MANY others. In other words, for me to sell anything other than what I know to be the best would be dishonest!! Please read on for further understanding of functions, facts and myths, maintenance, & more in depth information as the article progresses!